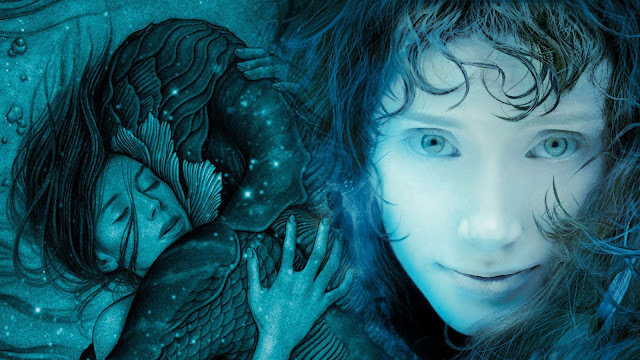 Watch: What if Guillermo del Toro directed "Lady In The Water"? Guillermo del Toro's latest film The Shape of Water (my review) is currently cleaning up with accolades and guild nominations during this awards season. Shape of Water is essentially a love story, with the unique spin being that one of the players is an amphibian who learns to communicate through sign language. After reflecting upon the film during the weeks since I first saw it, I started thinking about a forgotten film from the 2000s, M. Night Shyamalan's much-maligned Lady in the Water. The unexpected similarities between Shyamalan's bedtime story and del Toro's film were hard to ignore. Both films feature protagonists who are custodians with communication disabilities. In Shape, Sally Hawkins is a janitor at a government laboratory and a mute. In Lady, Paul Giamatti is an apartment building superintendent with a bad stutter. They both live lives of solace (Hawkins lives above an old movie theatre and Giamatti lives alone in a tiny pool house). Their love interests both come from the water. In Shape, Doug Jones plays an amphibian creature with special powers. In Lady, Bryce Dallas Howard plays a sea nymph, who assigns powers. While Howard's character does in fact speak English in Lady in the Water, she goes through stretches of the film communicating only in sign language, much like Jones' amphibian. Both del Toro and Shyamalan's films feature magic and creatures (Lady has several that show up near the end). And the main crux of the plot for both films involve a band of unexpected heroes working together to "save" their new amphibian friend. Of course, just drawing parallels wasn't enough for me. I went ahead and re-edited the trailer for Lady in the Water to the tone and style of del Toro's The Shape of Water.